Connecting & Fundamental Feel Ground Skills Course. Three or six (if you extend into the postural development course) full days to immerse yourself in learning the philosophy and techniques of “Connecting with Horses and Riding with Synchronicity”. This Ground Skills course is the most important of all the courses I teach. It sets the foundation of concepts and principles from which all the rest is built. It is essential for all who are new to this teaching whether they are a beginner or had years of experience. 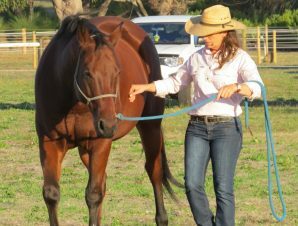 It begins to teach people how to understand their horses minds, emotions and their physical bodies. You will also learn about the spiritual nature of horses and the spiritual connection between horses and humans. 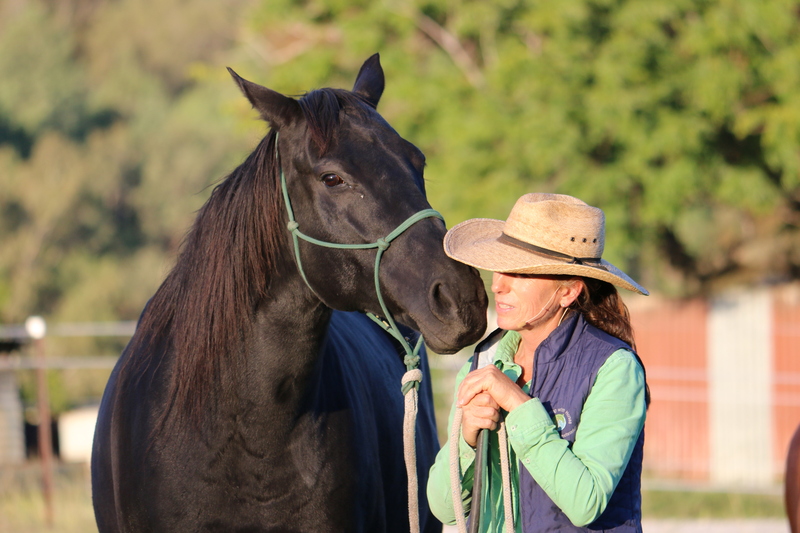 This course teaches the core principles of centering, breathing, body scanning, energy awareness and body language which are all essential keys to success with horses. Begin the journey to becoming a “true” horseman. “True” meaning with the qualities that the horses themselves would choose to have in a horseman. Connect with your horse’s heart and mind and hear what horses have to say. Learn to listen. 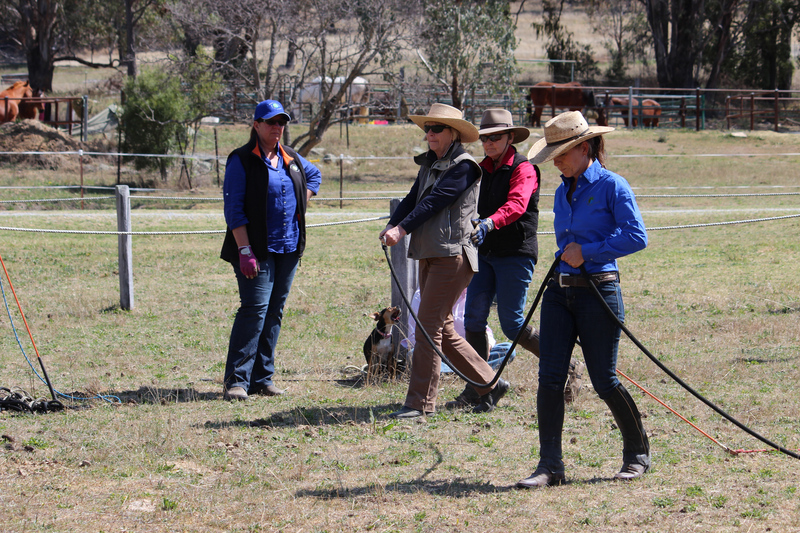 Develop safe horse handling skills and habits on the ground. Come along with or without your horse. Of course if you can bring your horse along your learning will be maximized as nothing beats hands on experience and having direct feedback from a supportive instructor to accelerate your learning. 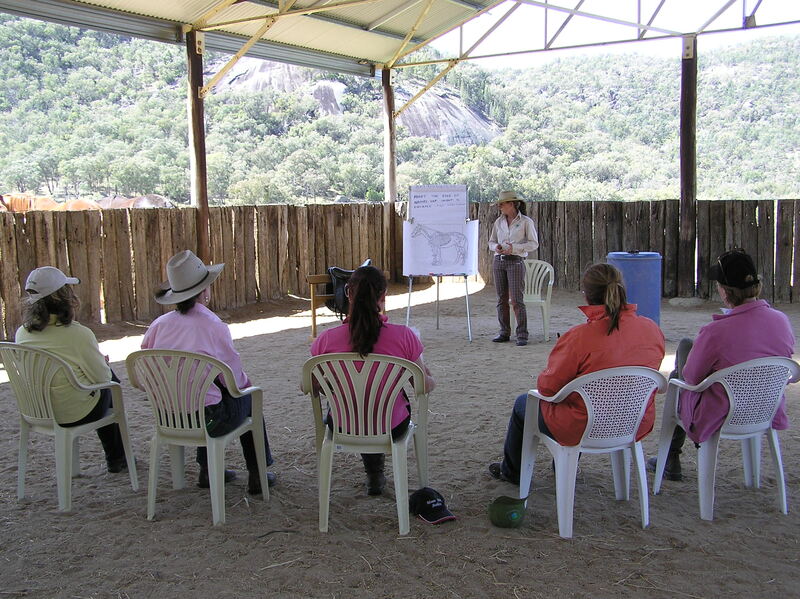 However the other option for attending these courses is to come and participate without a horse, in which case you would actively participate in all of the theory sessions, Q & A sessions, body awareness and balance sessions, healing sessions and simulations as well as watch the demonstrations and observe those with horses practice and experiment with the exercises and tasks. All of these “non-hands on” with horses sessions actually make up a big percentage of the course which is why the pricing for those wishing to come without their horse is approx. 50% of the full course fee. People coming without their horses are not just fence sitters. They get equal value to those bringing horses for at least 50% of the course. The cost to come with your horse is $595 for the 3 days (if a 50% deposit is received before April 1st ) or $695 there after. The cost to come without your horse is $95/day or $285 (if a 50% deposit is received before April 1st) or $115/day or $345 there after. Please scroll down for booking forms. This course is designed so that people can flow on into it straight after doing the ” Connecting & Fundamental Feel Ground Skills Course”. Virtually everyone that owns a horse and wants to ride it. This program can help horses with hollow backs, weak backs, poor top lines, poor posture, down hill horses, horses that pull themselves along with their forehand, horses that don’t travel straight, have trouble turning, bending, picking up a certain canter lead or have difficulty with you on one trot diagonal. It will give you the tools to prepare your horse to be balanced and develop some strength in preparation for riding either because your horse has been on a spell, has never learned to use his body well or is about to be started under saddle. It can help with horses who are spooky, shy, oversensitive and reactive, impulsive or who lack impulsion and are shut down and lack energy and motivation. It can help any horse that does not have correct and healthy biomechanics, which is probably 99% of horses. This therapy is very powerful in making changes in the horse’s body but it may in some cases need to be supported by other bodywork, nutritional supplementation and corrective/supportive trimming and hoof care. Just like everything else in the horse world there is a lot of confusing and conflicting information out there about hindquarter engagement, biomechanics and collection etc. So how do we know what is truth ? Primarily listen to the horses – when we know how to listen to them which includes reading their body language -they will show us the truth. It is the only way to decipher the truth from all the information out there. When the horses look prouder, taller, have more presence, are more relaxed, more willing and are offering things with a happy expression on their face, then you will know you or who you are following are on the right track. My foundation of learning on this particular subject came from the BALANCE organisation (the developers of the BALANCE saddle) which I combined with my own learning in Feldenkrais and Aikido and of course hands on experience with many, many horses. There is a book that I can recommend to support this learning – The Horse’s Voice by Keren Morris – you can purchase it on Amazon or through me. This book has the most correct information on biomechanics that I have seen published. I highly recommend that people learn and do this ground work therapy program before coming to my riding courses so then your horse will be more prepared mentally, emotionally and physically before being ridden. The difference between posture and conformation. What a healthy horse’s back and healthy movement look like. Why so many horses have poor posture, balance and biomechanics. How to start changing their posture, balance and lead them back into a better biomechanical way of moving. Healthy posture and biomechanics leads to happy horses and happy riders. Horses are more comfortable, more relaxed and things feel effortless and easy when they are using their body with correct biomechanics. They will stay sound, be calm and be athletic. Basically this means you could have everything that you could ever want in a horse. A calm, safe, sound, healthy, athletic, responsive, balanced horse that is willing, enthusiastic, has good energy and impulsion and has a proud majestic presence. What more could you want ? I think that I just described the perfect horse for any discipline !!!! For the biomechanics to be right, the whole process must be based on horses being deeply relaxed. A relaxed horse means a safe horse. Most people misunderstand relaxation. Most people think of relaxation as being slouched on the couch with no energy. But there is a different form of relaxation – where the body is totally relaxed but equally, the body is poised, alive with energy and ready to go – this is the form of relaxation that we are talking about. This is the state that the elite of the elite sports people operate at. The foundations are in learning to operate in a “centered state” for horse and human – a concept I learned through martial arts. The Introductory Connecting & Ground Skills Course teaches this vital foundation. Why are the initial stages for developing better biomechanics better done on the ground than under saddle ? Without the weight of the rider or the saddle, the back muscles in particular, are not restricted and are much more easily able to recover. The less skilled the rider and the heavier the rider is, the more inhibitive they will be to the correct biomechanical movement of the horse which makes it impossible for the horse to find correctness and therefore impossible for the nervous system to be reprogrammed as to what healthy movement is. Without a rider the horses can develop the strength to carry the weight of their own forehands with their hindquarters, before adding the additional weight of a rider and saddle. Even when we are highly skilled in helping horses use their bodies well while riding and light weight, it is often quicker in the long run and easier for the horse, if we do the initial stages on the ground. If riders are overweight, unfit and unbalanced the groundwork program will also help them to get into a better state of fitness, body weight and body awareness and develop their posture and biomechanics, which is essential to riding horses well. This course is just an introduction which can be followed by more advanced courses and supported with video coaching. To get maximum results I would allow a minimum of 4 weeks to do this ground work therapy program WITHOUT riding. Please note that this is very specific ground work that supports correct quality movement. Groundwork without this quality and understanding will not produce the same results and in fact may be detrimental to your horse. Some horses with very poor postures may need longer, 6-8 weeks. Traditionally in Europe it was not uncommon to do a preparatory ground work program of 3 months before a horse was ever ridden. Sometimes we need to “slow down to hurry up” and “go back to go forwards”. As in any endeavor, when we take the time to set a solid foundation we end up with a good and long lasting result. At first the prospect of not riding for 4 weeks might seem daunting but you will most likely be surprised by how quickly the time passes and how interested you become in the process as you observe your horses changing and learn more about them. 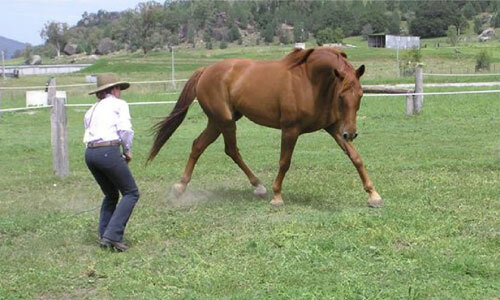 The process is simple and anyone can learn to work with their horse on the ground in this way. Sometimes the power of “simple” is overlooked. Patience, focus and awareness are what is required and you will develop these three things a lot more during the process. Also in the process, by connecting in, being so present and doing something great FOR your horse, you will build an incredible bond between yourself and the horse. The qualities of feel, timing and balance learned on the ground through this process will also help develop the skills you need to be a great rider. To be eligible to do this course with your horse you will need to have completed an Introductory Connecting or Fundamental Feel Groundskills course with me. You may come along without a horse without having any prior learning with me. Following are some before and after pictures of a few of the horses that I have worked with showing the changes in their postures. Most of these changes took place over a 6-12 week period. The process involved groundwork, riding and energetic healing and bodywork. Of course if you can bring your horse along your learning will be maximized as nothing beats hands on experience and having direct feedback from a supportive instructor to accelerate your learning. However the other option for attending these courses is to come and participate without a horse, in which case you would actively participate in all of the theory sessions, Q & A sessions, body awareness and balance sessions, healing sessions and simulations as well as watch the demonstrations and observe those with horses practice and experiment with the exercises and tasks. All of these “non-hands on” with horse sessions actually make up a big percentage of the course which is why the pricing for those wishing to come without their horse is approx. 50% of the full course fee. People coming without their horses are not just fence sitters. They get equal value to those bringing horses for at least 50% of the course. 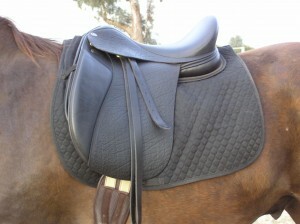 Private lessons ($110/hr), Saddle fittings and opportunities to test ride the BALANCE saddles are available on request. Saddle fittings with the BALANCE saddles take 1 1/2 to 2 hrs. cost $150. Bodywork/ PEMF (Pulsed Electromagnetic Field) treatments upon request $110. For details about the venue, including directions and horse and human stay, contact Sharryn.